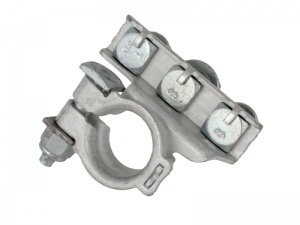 Terminal clamp with three connections studs for standard tapered positive battery posts. This configuration is particularly useful for installations where several accessories are required to be directly connected to the battery posts and where otherwise a separate bus bar would need to be used. 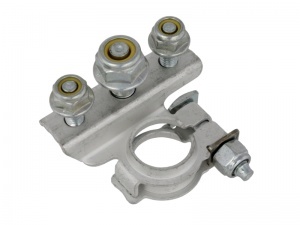 Studs are 2x M6 and 1x M8 and are fitted with nyloc nuts to prevent loosening under vibration.